It all started with Growning Pains. Who can resist an adorable homeless teen who is saved by The Seaver Family? Certainly not I. This started it all for me. Luke was my type. The eyes, the smile, the blonde skater cut...I was a 12 year old in love. Then came What's Eating Gilbert Grape, closely followed by The Basketball Diaries. These two movies, I think, are what gave him the substance to be considered an 'actor' and not just a pretty face. In Grape he rocked his character and there was not one moment in that entire film that I saw Luke from Growing Pains. Basketball Diaries opened my eyes to a life I would never want to live. And now that that scenario has become reality for our family, I don't think I could ever watch it again. His portrayal of an addict is all too real. So real that I'm surprised DiCaprio never got involved in drugs. His portrayal is beautiful and raw, something that is so surprising that an actor his age could offer. 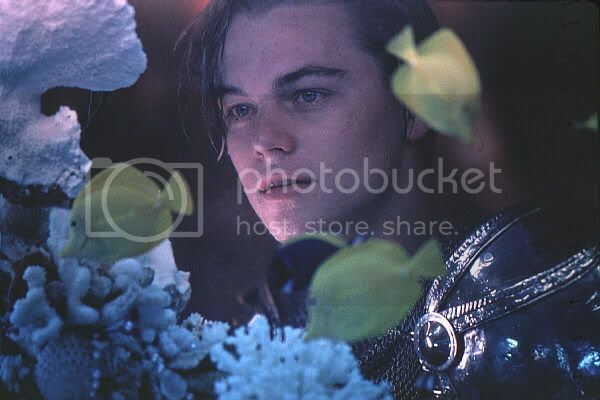 My love for Dicaprio changed when I saw Romeo & Juliet. I watched it with my then boyfriend, now husband, and it quickly became our movie. We both loved Baz Luhrman and being seventeen year olds in love we easily saw ourselves in Leo & Clare. To this day we watch it whenever it is on. It reminds of the time when we found each other. An easier time where all we had to worry about is getting caught sneaking out of the house to watch late night modern Shakesphere. My love quickly turned to hate when I saw Titanic. He was awful. It was cheese. His celebrity became overwhelming. He sat court side at Lakers games and wore masks over his face when leaving celebrity haunts. His movie choices reflected his celebrity and soon enough I couldn't stand watching him in anything. Then Gangs of New York came out. My love for him as an actor flourished. He was good, brilliant even, while portraying Amsterdam Vallon, the boy whose father was killed by Bill the Butcher. He acted side by side Daniel Day Lewis he held his own. Somehow Leonardo DiCaprio had gotten out of the Titanic shadow. After Gangs of New York I saw DiCaprio as an honest to goodness actor. He was talented and it showed. The movies he choose after GONY were good too. The Departed, Catch Me If You Can, and The Aviator all showcased the talent that I knew Leo DiCaprio possessed. I was in love again. And then he fucked me over. Blood Diamond came out and I couldn't have hated him more. His British/American accent was bloody awful. The plot and the cast seemed like a perfect fit and then he spoke. It was a complete hack job. Now I await his next movie. A Scorsese partnership, in which Leo usually excels at, Shutter Island. It looks creepy as hell. Leo is paired up with Michelle Williams, who I adore, and it was all filmed at a condemned mental institution. It looks simply intriguing. It has been said that Leonardo DiCaprio is the best actor from my generation. I'm not sure that I agree. I just think he has been given more opportunities in film than any other actor his age. I think there are a few boys who would give him a close running if they had the chance, namely Ryan Gosling and Joseph Gordon Levitt. Other then them I can't think of any others who could even come close to Leo's talent. Can you? Who do you think is the best actor of Generation Y?